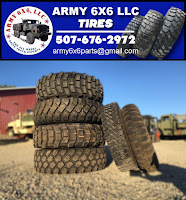 "It's the service after the sale that counts"
Another Army 6x6 LLC at work! M931A2 in Michigan pulling a 65,000lb $1.5 million plus value yacht for winter storage. Montgomery County Emergency Services District #3 using a truck purchased from us. Truck was used to evacuate 100's of people during Hurricane Harvey. Thank you for your service! I purchased a 1986 M927a1 from Army 6x6 two years ago and I can honestly say that the machine has totally beat all of my expectations. The machine is used on a reclamation seeding crew and is worked regularly for 12 hours a day. Not only does the truck get ran all day in harsh conditions year around but we also drive this truck to every job that is within 100 miles of our shop daily and we have experienced very little mechanical problems. We actually experience more issues with our brand new semi trucks than we do with our 6x6. Most important of all is the service that Andy and Jim provide after the sale, if I ever need anything they have it coming to me immediately and they are always more than willing to help with any questions that I have about the truck and I have had lots of them. The two of them know these trucks inside and out and can definitely answer any questions I have. We run a fleet of dozens of pieces of equipment including Cat, Deere, Finn, Peterbilt, Ford, Chevy, and Freightliner all of which are 2012 or newer and I can say without a shadow of a doubt that the best dealer that I deal with is the one that I spent 20k at Army 6x6, not the ones that I have spent several 100k at. I WOULD NEVER BUY A MILITARY VEHICLE FROM ANY OTHER SOURCE NO MATTER THE PRICE. Thank you Danny Burton Advanced Land Enhancement Solutions LLC. M931a2 at work in a gluten processing plant located in Hamburg, Iowa.